Saddle soap is a product used to keep your leather horse tack and equipment from molding, drying out, cracking or otherwise deteriorating. Tack that has not been kept clean and in good condition is generally not considered safe to use. Saddle soap should be used regularly as part of your routine tack maintenance. 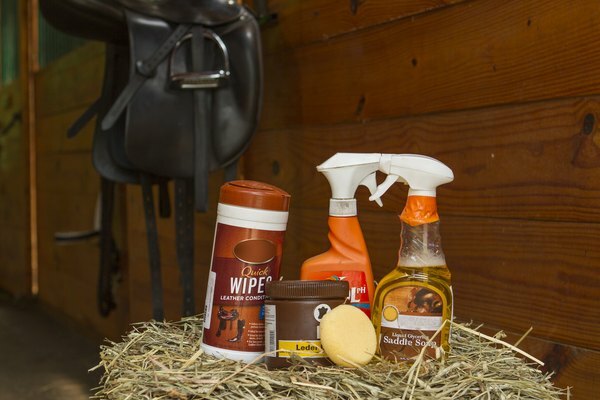 While a number of different brands of saddle soap are available for purchase in any tack store or other retail business where leather cleaning supplies are sold, these products tend to contain the same general ingredients. Glycerine can be purchased as both a liquid or used in bar form. It has been used to clean saddles and other leather for many years. Glycerine is best known for its ability to draw and retain moisture, which keeps your leather supple and properly hydrated. Neatsfoot oil is another commonly used leather cleaner. It is derived from lard and is best used for lubricating dry leather, though it is well known for darkening light colored leathers. Lanolin also may be seen on the ingredient list for saddle soaps. Lanolin is a waxy substance that originates from sheep's wool. Lanolin works as a moisturizer for the leather and also provides waterproofing. You also may see products advertised as oil soap or as containing oil soap. Oil soaps are a general leather cleaning product derived from vegetable oil; they contain the same glycol used in glycerine soap. Saddle soap can be used on any type of leather product. 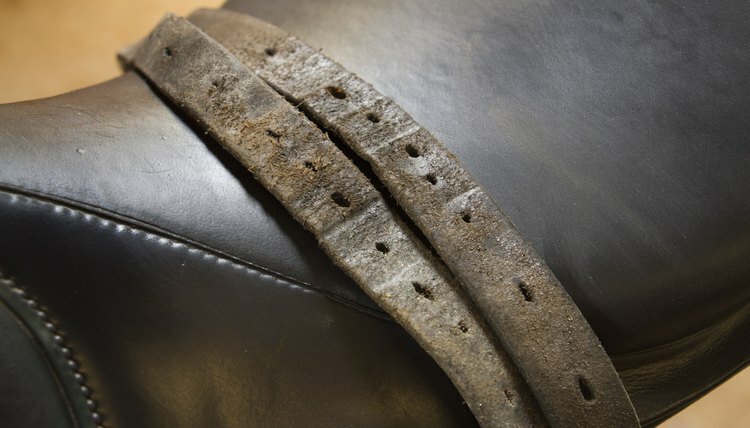 Before you start using saddle soap, you should use a dry, clean sponge or cloth to brush any existing dust, dirt and debris off of the saddle or other leather item. Once you have removed the first layer of dirt, apply a small amount of saddle soap to a clean, damp sponge or washcloth. Rub the saddle soap into the leather. The saddle soap will absorb as you work it in. Use a new, clean cloth to wipe away any excess soap. It is customary to use leather conditioner on your saddles, tack and other leather items after you have used leather cleaner. It is necessary for you to choose a good quality conditioner that will help restore oils, moisture and protectants to the leather after it has been cleaned. 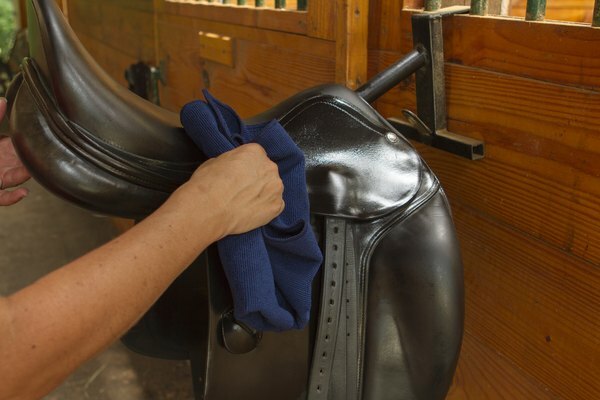 Leather conditioner can be applied with a clean sponge after the excess saddle soap has been wiped away. Saddle soaps can dry out leather over time if you do not condition your leather properly after using soaps. Some saddle soaps, such as those that include neatsfoot oil, can stain and darken leather. Saddle soaps derived from mineral oils can eat away at the stitching on your leather items over time. It is important to educate yourself about what type of saddle soap will be best for your particular type of leather, as some leather products are sturdier than others. If you are unsure of how to clean your specific leather item, contact the manufacturer and ask for care instructions and recommendations. 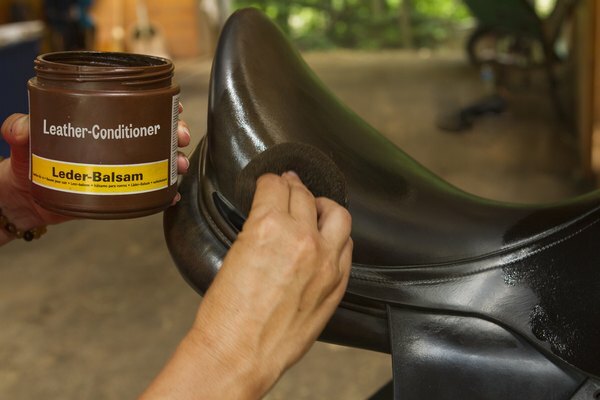 Horse Channel: Active Ingredients What's In Your Saddle Soap?